The best source of W-2 requirements may be found on this official government site. How do I know my W-2/W-3 numbers are correct? To ensure your W-2/W-3 numbers are correct, first compare them with the Taxable Wages and Withheld report. This report may be found in Payroll, Reports, Standard Reports, End of Period, Taxable Wages & Withheld. Caution: this updates the W-2s to the most recent data in the accounting software, but also replaces any manual edits. Manual edits will need to be reentered. Check each employee record to ensure they are marked as W-2 in the Tax Statement field (see image below left). If you are required to update the Tax Statement field in any employee record, you must again go into the Edit Employees W-2 Information screen and select Reprocess All. If new to ParishSOFT Accounting Payroll, you may need to enter your Employee Start Up Totals under Payroll, Setup, Optional Setup, Start-Up Employee Totals. 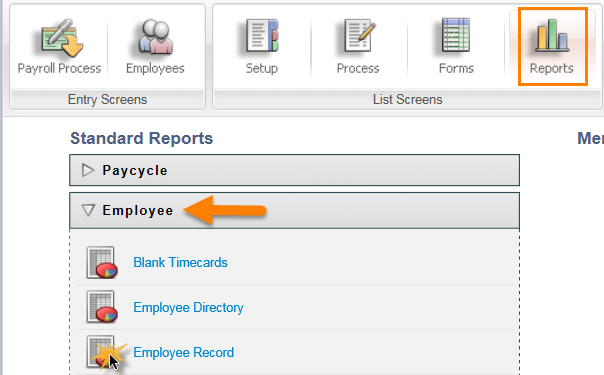 For additional information on this, see your online Payroll User Guide and search for Start-Up Employee Totals. Or, you may need to check each employee's Tax Data page to ensure the Federal Tax Withhold box is marked (see image above right). If it is not marked, it prevents taxable wages from accumulating. Although you should mark it now, marking it after any payroll was generated for the reporting year will not accumulate the W-2 totals retrospectively. If this is the case, you must edit the W-2 manually (in Payroll, Forms, Edit Employee's W-2 Information) and edit the 4th Quarter 941 (which is editable right from the report screen) to reflect the additional wages. When choosing the W-2, 2-Up Pre-Printed Form, you may use this option to print W-2 Copy A, W-2 Copy D, and W-2 Copy 1. It will print two employees per form. To use this option, we highly recommend this help article on Form Alignment before proceeding. I received the following error when I select the Preview Report option for my W-2/W-3 forms. This message indicates the government has not yet released the W-2/W-3 format and requirements for the year you are trying to print the forms or our 3rd party form company has not yet made a form available for that year. Normally, this message is displayed late in the year when customer's are eager to prepare for the end of the year and want a preview of their W-2/W-3 information. Until the form is released, we suggest you run the W-2 Review Report (top option in Forms, W-2 / W-3, Form Name) and/or the Taxable Pay and Withheld (refer to the beginning of this article to learn how to run this report) to get a current snapshot. If your Accounting month is current, you may select the Calendar Year to Date option to get the most up-to-date figures. How do I file my W-2 Forms Electronically? and when is it required to do so? NOTE: If you are filing W-2s for more than 249 employees, you must file them electronically. Some States also require electronic filing, check with your State for their filing requirements. First, go to theNelco Website for Electronic Filing to get an overview on how it works plus pricing information. Charges reflected in the W-2 Service box are per employee. Once there, you may create an account and add your credit card information, or you may wait until you've actually transmitted the W-2 form from the Payroll, Forms site to create your account. If you choose to do so ahead of time, from the Nelco Site, click on the Filing Home tab. If you have not done so already, you must create an account. Select the Create Account Link below the login fields. NOTE: Passwords must be between 8 and 30 characters. Once you create your account, click the confirm button. Next, to add your credit card information, you will click on Manage Account, then Update Payment Information. Now you are ready to Process your W-2s electronically. Once you have an account with Nelco, you may transmit your W-2 electronically by going into Payroll, Forms, W-2 Electronic Filing. Click Transmit W-2. You will be taken to the following site. If the transmission goes through, you will be all set. If you receive the message below the actual errors will be listed. Most items listed you can fix by going to Payroll, Setup, Employer Information or by going to Employees, pulling up the Employee listed in the error report, and going to the Tax Data Tab.